On Sunday, Iranian President Hassan Rouhani addressed the growing protests against the government. 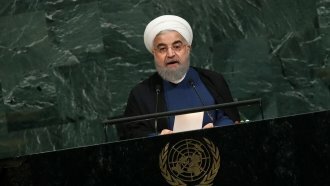 Rouhani told his Cabinet that Iranians are free to protest and criticize the government. But he made it clear he does not condone violence or damaging public property. His statement came on the fourth day of the anti-government protests. Dozens of people have been arrested, and two people have been killed. The protests started as a small demonstration about rising prices for gas and food, and social media played a role in the increasing size. Since then, the government has blocked access to certain social media sites. Multiple U.S. officials have commented on the unrest, including President Donald Trump, who tweeted support for "peaceful protests."